Detailing the physical features, habits, territorial reach and other identifying qualities of the Implicit Arches. The soft brown spot nestled on the green wings of an Implicit Arches may help explain its common name. Implicit Arches is closely related to Laudable Arches. Laudable Arches has an obvious dark brown spot on each forewing, but Implicit Arches' brown spot is more subdued or implied. 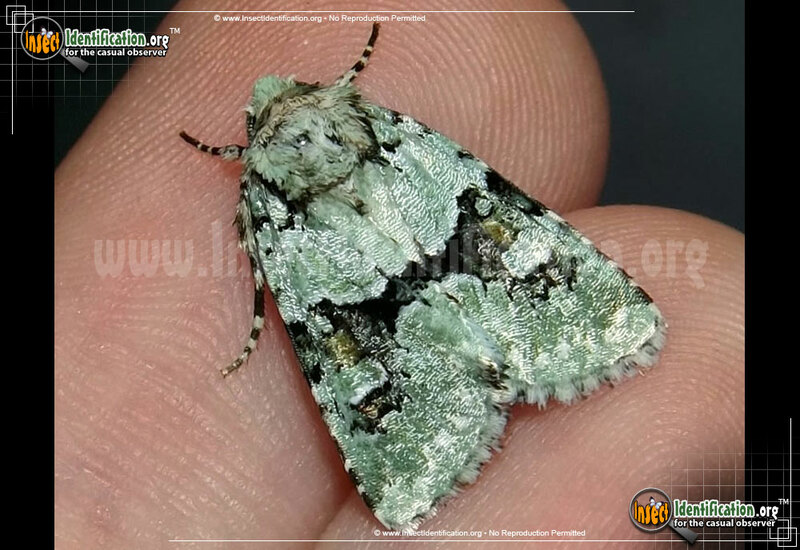 The minty green moth has a black band crossing the middle of the wings. Each understated brown spot on the Implicit Arches is sandwiched between both a small and a large green spot in this dark band. Light green hairs on the thorax sometimes share space with black and white hairs. Legs have bands of mint green and black on them. Adults are active from spring through autumn, and their caterpillars can be found nibbling on weeds like dandelion, a variety of herbs, and possibly dead or dying leaves. They are smallish, and can easily get overlooked among grass and other green vegetation.